Want to give your baby a jump start in learning how to talk? A new study suggests that it may be better to put down the books and pick up a simple musical toy instead. 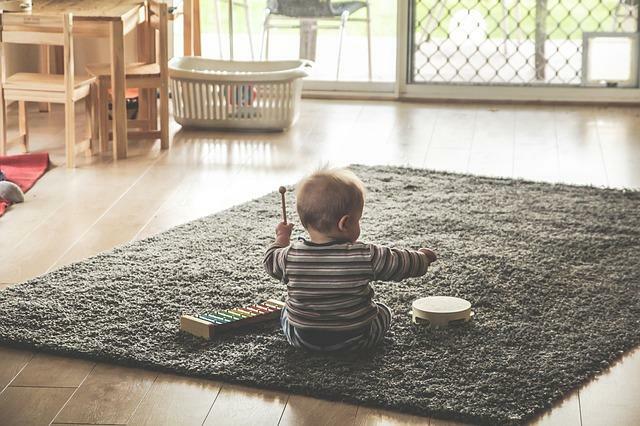 According to the research, early music training may help benefit speech learning later on by improving the child’s ability to detect patterns in complex sounds — a necessary skill for talking. Music and speech are far more closely related than one might expect, and in our brains the two are processed nearly identically. Research has shown that individuals who received musical training in early childhood tend to be more linguistically gifted, but there’s one caveat to research backing this claim: Did these children’s parents pursue music training for their children because they already seemed to have superior auditory skills, or did they develop superior auditory skills due to their musical training? In order to answer this dilemma once and for all, researchers from the University of Washington in Seattle conducted a randomized lab-controlled study on the effects on infants of early music training over 12 sessions lasting 15 minutes each. For the study, the team had 47 nine-month old infants raised in monolingual English-speaking environments randomly assigned to either take part in a musical intervention group or a control group. Although the infants exhibited a normal range of babbling, none had any words at this age. During the musical intervention sessions, the children were subjected to toys that played specific tunes. “All the songs were in triple meter — like in a waltz — which we chose for being relatively difficult for babies at this age,” study co-author Dr. Christina Zhao told Medical Daily. With the help of their caregivers, the babies tapped out the beat of the music using maracas or their feet or were bounced in synchronization of the musical beats. The control infants instead played with toy cars, blocks, or other objects that needed to be stacked or moved. All the babies were also given social experiences that required active involvement and body movement, something which Zhao explained has been shown to help babies learn. In order to test if the musical intervention had any effect on the children’s development of speaking, the team used a technique called magnetoencephalography (MEG) to measure the infant’s neural responses. During these recordings, the infants heard tones in the triple meter as well as sounds from a foreign language. According to Zhao, MEG differs from other types of brain imaging technology in that it allows researchers to precisely pinpoint the timing and location of brain activity without requiring the infants to be absolutely still (such as in an MRI). “MEG has extremely high temporal resolution that allows us to observe brain activities at the millisecond level as well as excellent spatial resolution that allows us to measure where in the brain activity is occurring,” explained Zhao. Results showed that musical training was associated with enhanced neural activity in auditory and prefrontal cortical regions in response to both the music and speech sounds. According to the researchers, the reason for this may be as simple as the old musician’s adage Practice Makes Perfect. Because music experience and exposure helps to improve the infant’s ability to detect patterns in complex sounds they are then better able to predict timing of future sensory events, most importantly speech. Past research has also made the connection between music and language learning. For example, a 2015 study suggested that not only is music similar to language, but that it is actually modelled after it. For the study, the researchers analyzed 48 pieces by the composer Bach and 24 by Chopin and found that the composer appeared to borrow cues from speech to convey emotions in their music. Pitches in the musical pieces were higher and faster in happy pieces than in sad, just as in human speech. At this point, it's not clear exactly what specific aspects of the music experience had an effect on the babies’ brains, and Zhao explained that this is a topic they hope to further explore in the near future. However, the results do help to give further proof of the importance of music and music education, especially in children. “We know that babies learn rapidly from a wide range of experiences and we think music can be an important experience that may influence their brain development,” concluded Zhao.